I love these delicious fruit snacks. The squeezy pouches are so easy to use while treading water in waves or taking in some nutrition in a pool swim.The are easy to reseal to split between a workout. 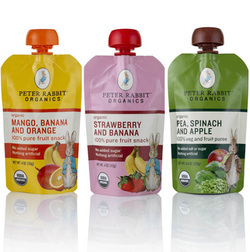 They are 100% organic, and are easy on the stomach during a workout or on-the-go. You're never too old! Thank you, Peter Rabbit, for helping me in this quest! 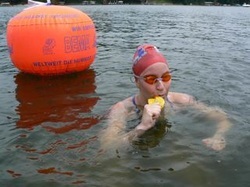 Refueling with a Peter Rabbit Mango Banana & Orange Fruit Snack while treading water on the second 5k of the 25k USMS National Championship, June 18, 2011, in Noblesville, Indiana. Delicious hand dipped chocolates and fruits, brand name candies, coffee bar, and the friendliest staff! Thank you, Marian, Norm and the Village Chocolatier! Gourmet breakfast, lunch, and dinner on the Tawas River. Thank you, Sandy, Tim, and Reed's on the River! Bike and boat friendly, catering, and free Wi-Fi. Try my favorites: breakfast burrito, spinach quiche, and "The Bella." Tri-Covery Massage & Fitness is dedicated to help an athlete naturaly maximize recovery in order to maximize performance. Thank you, Jef Mallett, creator and cartoonist of the comic strip Frazz, for your support!